haha way to use that useless waste of space (and trees! )why do they even print them anymore?!? There were some projects for giftbows in GreenCraft magazine I wanted to try, but they didn't have any visual step-by-step instructions. Thanks for posting your very helpful tutorial! I loved the magazine version, but I think I like this one even more! I'm pinning this! :) love it! I loved the magazine version. We did it as a project with my MOPS group. They are just so cute! very cool. 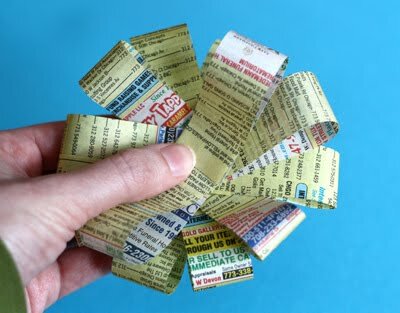 I am on the don't deliver yellow pages list- but still they drop them on my door... now I have a new idea what to do with them! oh! How i love this blog so much! thanks for all the wonderful ideas. oh, I'm glad those books are good for something besides doorstops :) and pretty to boot! I made these at Christmas out of scraps of wrapping paper to coordinate with the paper on the boxes and gifts. It was a ton of fun and best of all, free! I love the tutorials you give here! 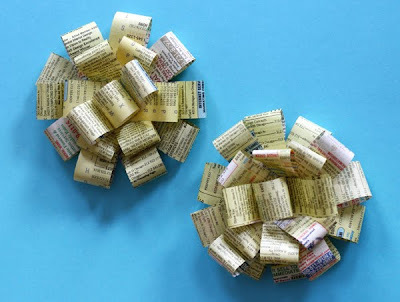 what a great way to transform "junk mail" and paper scraps. i'm all for recycling, especially when it looks as good as these bows! What a great tutorial. I will have to try this for my next gift. I adore this!!! I'm going to try it out. Thanks! 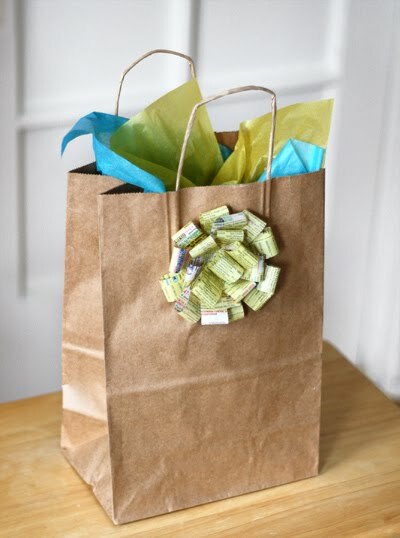 I've got a little girl's birthday tomorrow and now I have a cute way of wrapping the present. I used pink paper though 'cause I couldn't find my Yellow Pages! Ah! I get a few of these every year and we end up recycling them or tossing them in the trash. This is a way better use for them! read the first comment and just wanted to say that I love using the yellow pages for all sorts of things (besides looking up phone numbers)! great for wiping extra glue off the tool your using when doing mosaics with paper (what I use them mostly for) and you can just tear that piece off when used up. Never thought of making bows tho, thanks so much for the idea! Those are adorable! And with the number of old yellow books lying around, you could have bows in stock forever. They're well done, too, they look nice. Looks fab, thanks for the idea! GREAT idea! I'll have to share this with my paper crafting club! That reminds me...I made a magazine page bow at Christmas-meant to make more, but you know, time- and my mom was so proud, she kept it. It sits in the kitchen now, and she told my sister, "You know, Susanne made that." Very cool! I have a dictionary just waiting for its day in the sun! I love these bows and use them all the time! When you have a moment, browse your local thrift store and grab some sheet music, they make super awesome bows! Oriental take out menus rock too! Thanks, Kate! And Susanne, I love that. So cute! 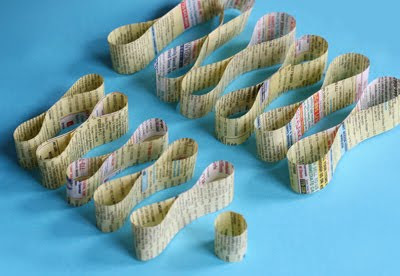 Gorgeous Idea! Thanks so much for sharing. Now this is adorable!! Our eco brides would LOVE this! Thanks for sharing.